**Dreaming** Here we are, in 2016, the year of endless possibilities. Jobs are popping up everywhere, housing prices have reached an affordable rate and families are gaining financial stability each moment. **Wake-up Call** It’s 2016! The housing market is still growing at an exponential rate even though it is predicted to grow at half the rate it did in 2015. Jobs are still hard to come by and more and more families are struggling to make ends meet. Worse off, somewhere between 40 and 76 percent of Americans live paycheck to paycheck. Now let’s get the facts. In 2014, the median household income was $53,657. This is not to be confused with the average household income which I can’t even seem to find a stat on. The median of any data set is the middle number. So, take all of the people in America, sort them by their income then find the income of the person in the middle. This is said to be the median income. The average or ‘mean’ income would add all of the incomes together and divide by the population. This number would be much higher taking into account millionaires, billionaires, and trillionaires, oh my! Of course, there are always circumstances that can affect income and to account for this, the Census Bureau has further broken down the household incomes into Family and Non-Family households. The median income for a Family household in 2014 was $68,426 while the median income for a Non-Family household was $32,047. So where in this lies the poverty line? In 2014, 14.8% of Americans lived at or below the poverty line. But, somewhere between 40-76% of American’s live paycheck to paycheck. Something isn’t adding up here. 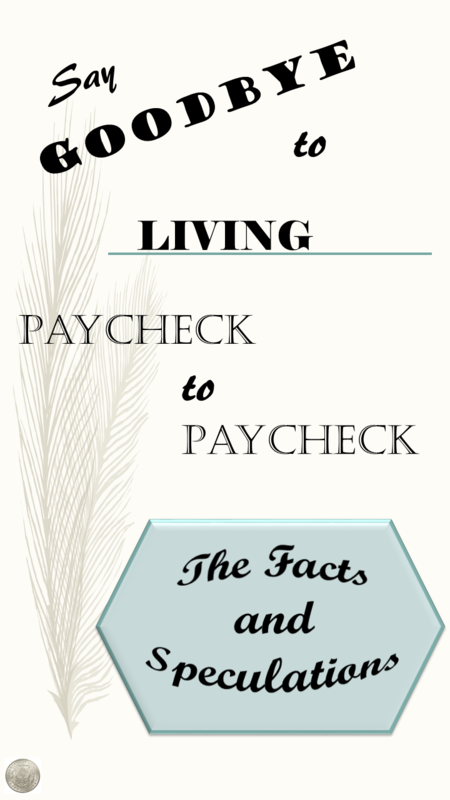 It would be easy to say that if you aren’t living in poverty you shouldn’t be living paycheck to paycheck but in all reality, that’s not the truth. There are many factors that affect a family’s bottom line including housing, transportation, education, childcare, credit card debt, and so much more. All of these factors can make it nearly impossible to get ahead and even more so, can bring down any expectations of being able to get ahead in the future. Que the average college student: “I’m never going to be able to repay my $40,000 loan so I should just pay the minimum for the rest of my life”. This attitude towards debt while legitimate is just depressing. What’s the point of going to school in the first place if you aren’t going to ever be able to get ahead. Que the high school or college drop out. Now, education is important but it’s not for everyone and that’s okay too. Over the past few years I’ve personally seen many friends enter into different trades and come out way ahead of anyone who even attempted to continue with school. And, aye yai yai. Imagine having all these student loans piling up and then realizing you need a roof over your head. In the Denver suburbs, the average rent for a two bedroom apartment is over $1200 per month! Rents and housing prices are so high that if I hadn’t bought my house when I did, I would be having to write a little faster to figure out how to get away from living month to month. While I’m not a parent, I know that the average childcare costs $972 per month or $11,666 per year! Luckily, the range is from $300 to $1564 monthly and you can choose where you would like to have your loved ones play and learn while you are at work. But then do you choose the more expensive day care hoping for a better education or for your child to have more individualized attention or do you go for the less expensive school so you can build up that college fund? Anyone overwhelmed yet? Somewhere between 40-76% of American’s live paycheck to paycheck. I would imagine that somewhere between 40% and 76% of Americans are beyond stressed and overwhelmed in correlation to their financial state. While there is no over-night remedy for the paycheck to paycheck lifestyle, I truly believe that there is hope and possibilities for everyone out there and that with a lot of work and dedication, small steps can happen. And from small steps come larger steps and leaps and bounds. It’s not an easy process, but a lot of times, finding where to start is the hardest part. Please come along on the ‘Say Goodbye to Living Paycheck to Paycheck’ series as we begin to scratch the surface and hopefully spread a bit of hope. Go to the next post in the series here. Really important topic. Can’t wait to see future posts! Sounds interesting…. You’re right, a lot of people live paycheck to paycheck these days. Can’t wait to read more! I can completely relate. My family is living paycheck to paycheck too. It’s really stressful. I look forward to reading the next part in your series. You’re so right, it’s pretty sad to think about it should be getting better not worse. Life has really become so expensive. Wher I live, rent for a 2 bedroom STARTS at about $2000 a month. And I live in an extremely middle-class neighborhood. Gas is still almost $3 a gallon. To be fair, wages are probably higher on average her too. Still, it really is so hard to get ahead. I feel bad that so many people live paycheck to paycheck. But I can definitely see why. Yes, it is expensive to live now but it is also comparative. House prices are high but interest rates are so low. My parents bought a house that’s the same price as my house but they bought theirs twenty years ago. When they first started their mortgage, it was 30% higher than mine is and wages were much lower 20 years ago. They made it. We can too. We just have to believe! Not too long ago I asked my friend to stop at the bank so I could deposit thirty dollars into my savings account. She told me she had never been able to save money. She’s over 60, by the way, like I am. Well, long ago when I was younger, I could have said that too, but when I finally did decide to save money, it turned out to be not only easy to put aside a few dollars, but also exciting, because I saw the money building up. That kind of excitement is motivating – and self-replicating. This is definitely true! The hardest part is starting for most people.